This week’s installment of Outlander Science Club is inspired by the many times we have heard Claire discuss the need to eat green leafy foods to avoid scurvy. “There may be some in the other bag. Eat those first, though; they’re good for you.” He shared the Highlanders’ innate suspicion of fresh fruit and vegetables, though his great appetite made him willing to eat almost anything in extremity. A grin bared his own excellent teeth. He took the apple away from his mouth and frowned at it suspiciously. In this week’s A Dram of Outlander Voyager Read-along, Jamie enlightens Lord John Grey on the topic of scurvy as well. “What are you doing, Mr. Fraser?” Grey asked, in some bewilderment. “To eat, Major,” Fraser replied evenly. He took the stained cloth bag from his belt and dropped the dropping green mass into it. “What in damnation other color ought a weed to be?” he demanded. Fraser’s mouth twitched slightly, and he seemed to be debating something with himself. At last he shrugged slightly, wiping his wet hands on the sides of his breeks. Grey felt his brows shoot up. “From my wife?” Fraser snapped. Throughout the first three Outlander books, we have seen Claire continually recommend fresh fruits and vegetables to avoid scurvy, among them apples, onions, cabbage, oranges, lemons, green herbs, meadow grass, charlock, juniper berries, mustard leaves, rose hips and dill seeds. To her Highland friends, she likely seems a quirky medicine woman, but given the proof she can show them of a mouth full of healthy teeth, some, including Jamie, heed her advice. Why was Claire so concerned about vitamin C intake? Vitamin C is an essential dietary component that humans cannot synthesize and therefore require in their diet. It is required in the production of collagen, plays an important role in immune function, and improves the absorption of iron from plant based foods. Vitamin C deficiency leads to scurvy. Adults who have a diet with minimal to no vitamin C will experience symptoms within 1 to 6 months, depending on their previous body stores. Initially symptoms will be fatigue, malaise, and inflammation of the gums. As the deficiency progress, collagen synthesis is impaired, and connective tissues become weakened. This leads to bleeding, bruising, joint pain, and poor wound healing. Open, draining wounds and loss of teeth follow, and ultimately, untreated scurvy is fatal. Until the end of the 18th century, sailors on long ocean voyages had little or no vitamin C and many developed and even died of scurvy. It is reported that in 1499, Vasco de Gama lost 116 of his 170 crew and in 1520, Magellan lost 208 of his 230 crew, all mainly due to scurvy. In the mid-1700s, British Navy surgeon Sir James Lind performed experiments showing that eating citrus fruit or juices could cure scurvy and by 1795, lemons or limes were standard issue at sea in the British Navy. Limes were much easier to obtain, as these grew in the British West Indies, leading to the American use of the nickname “limey” to refer to the British. What foods are good sources of vitamin C? Fruits and vegetables are the main sources, but in addition, organ meats (especially liver), oysters and cod roe contain vitamin C. Surprisingly, potatoes are a good source – Claire was protecting the people of Lallybroch from more than simple starvation in advising them to plant potatoes! Missing from this list is watercress, often a source of vitamin C for Jamie and Claire, and highlighted in the photo at the top of this post. Watercress contains 43mg of vitamin C per 3.5 oz serving! Symptoms of vitamin C deficiency arise when vitamin C intake falls below approximately 10mg per day for many weeks. Recommended daily intake varies by agency. Experts in the US and Canada recommend 90mg daily for men and 75mg daily for women. 40mg per day is recommended by the UK and India, 45mg per day by the World Health Organization, 80mg per day by the EU and 100mg per day by Japanese health authorities. Surveys show that Americans have a daily vitamin C intake exceeding these recommendations. However, one thing to keep in mind when assessing this is that smokers and those exposed to second-hand smoke require an additional 35mg per day. It is likely that living in a small home heated by a peat fire puts our Highlanders in this category of second-hand smoke exposure and would result in a requirement for increased intake of vitamin C.
And what about those Highland coos and their healthy teeth? With the exception of humans and other simians, fruit bats, and guinea pigs, other members of the animal kingdom actually synthesize vitamin C, so it is not a vital substance they must obtain in their diets. It seems that although cows consume grass and other leafy greens all day long, their dental health isn’t due to the vitamin C content of their diet, though it does make for a good argument in convincing the men of Ardsmuir to eat their greens! MacDubh gingerly set down a fistful of wilted stalks, and sucked his pricked fingers. Morrison’s lined face cracked in a grin. An elderly man, he knew well enough how to handle recalcitrant patients; he only liked to complain for the fun of it. Food for thought this week: In the absence of modern supermarkets with a year round supply of endless varieties of fruits and vegetables, and without vitamin C supplements, would you be able to find enough vitamin C in the foods seasonally available in your area? If you found yourself in a situation akin to The Walking Dead on AMC, or perhaps similar to One Second After series of books by William R Forstchen, cut off from the rest of the country, would you be able to obtain adequate vitamin C year round? Knowing what we do now, perhaps we would all be planting potatoes – to fend off both starvation and scurvy! 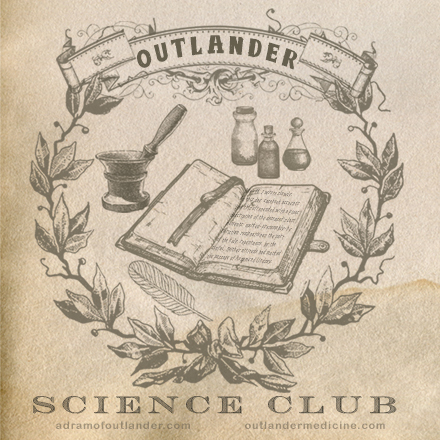 Listen to this week’s Outlander Science Club and this week’s A Dram of Outlander Voyager Read-along HERE!